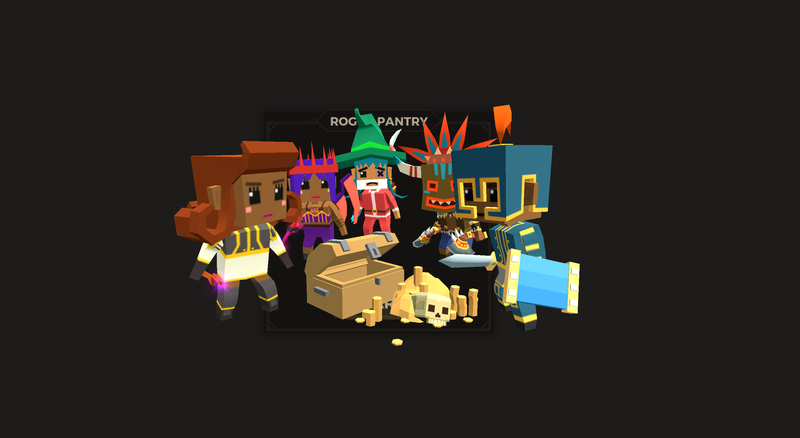 Rogue Pantry is an experiment in creating a rogue lite in a constrained aspect ratio (192x192). The game is designed to be played with just the mouse. Combat is divided into two phases, attack and defend. By timing your mouse click with the indicator, you can score critical hits and critical defense which are double the normal values. The size of the red area in the action meter is determined by the critical value of your current weapon/shield. Upon defeating your enemy, you can increase one of your 3 stats, health, strength and defense and you will receive a randomly generated loot item. This will either be a weapon or a shield and could have better or worse stats than what you currently have. You have the option to either equip the new weapon/shield (replacing the one you already have), skip, or re-roll. Re rolling can either give you a new weapon/shield or nothing so beware. Clothing and accessories are cosmetic only and have no gameplay altering values. Only your current shield and weapon have value. The bottom of the screen shows your stats. Health is on the top and strength/defense are on the bottom. The first value in strength/defense represents your current strength/defense level. This is increased by leveling up after battle. The second value indicates your absolute attack/defense rating which is how much damage you will inflict/prevent during each combat phase. This is a combination of your current weapon/shield's strength and your strength level. NOTE: By hitting critical attack/defense moves you effectively double this attack/defense rating.